The 21 Convention is a full 4-day event and features top thought leaders in dating, relationships, exercise, nutrition, as well as what is takes to be the leader you were meant to be. - Develop world-class social skills that permeate friend, professional, and academic relationships. 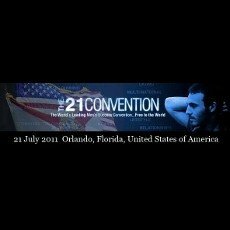 - Full access to The 21 Convention 2011 (North America), including the bonus meet and greet. - Permanent 5% discount towards all DVD products available in our store. - Free 720p HD streaming access to all footage from this event. - Discounts on paid coaching and services offered by speakers at the event. - Buy together for $150 and save $25. Return Policy: All ticket sales final, refunds are not available for any reason. Ticket Transfer Policy: All tickets are transferable at any time (up to 10 days before the event begins). Contact the event organizers for more information.